It's time to work on reversing or managing your osteoporosis condition starting today with regular exercise and healthy eating to help with pain relief, your overall fitness level and longevity. Osteoporosis is a serious medical condition (which can also bring-on a a painful chronic arthritis condition) consisting of the ongoing loss of bone strength and density, thinning of bone tissues and increased vulnerability to fractures. Osteoporosis may result from disease, dietary or hormonal deficiency, a lack of physical activity over the course of many years or decades, or simply due to the ongoing aging process. Regular exercise plus vitamin and mineral supplements may help reduce the loss of bone strength, reverse arthritis-like pain, and even reverse a loss of bone density, plus contribute to your overall health and wellness, combined with greater longevity. Talk to your doctor, nurse, or pharmacist about medicines you can take to build strong bones. We suggest calcium and vitamin-D. Although there is no cure for osteoporosis, several medications approved by the U.S. Food and Drug Administration (FDA) can help stop or slow bone loss, or help form new bone, and reduce the risk of fractures. Currently, alendronate, raloxifene, risedronate, and ibandronate are approved for preventing and treating postmenopausal osteoporosis. Teriparatide is approved for treating the disease in postmenopausal women and men at high risk for fracture. Estrogen/hormone therapy (ET/HT) is approved for preventing postmenopausal osteoporosis, and calcitonin is approved for treatment. In addition, alendronate is approved for treating osteoporosis in men, and both alendronate and risedronate are approved for use by men and women with glucocorticoid-induced osteoporosis. Alendronate plus vitamin D is approved for the treatment of osteoporosis in postmenopausal women and in men. Risedronate with calcium is approved for the prevention and treatment of osteoporosis in postmenopausal women. Alendronate (FosamaxI1), risedronate (Actonel), and ibandronate (Boniva) are medications from the class of drugs called bisphosphonates. Like estrogen and raloxifene, these bisphosphonates are approved for both prevention and treatment of postmenopausal osteoporosis. Alendronate is also approved to treat bone loss that results from glucocorticoid medications like prednisone or cortisone and is approved for treating osteoporosis in men. Risedronate is also approved to prevent and treat glucocorticoid-induced osteoporosis. Alendronate plus vitamin D is approved for the treatment of osteoporosis in postmenopausal women and in men. Risedronate with calcium is approved for the prevention and treatment of osteoporosis in postmenopausal women. More info is on web medical doctor. Alendronate and risedronate have been shown to increase bone mass and reduce the incidence of spine, hip, and other fractures. Ibandronate has been shown to reduce the incidence of spine fractures. Alendronate is available in daily and weekly doses, while alendronate plus vitamin D is available in a weekly dose. Risedronate is available in daily and weekly doses, while risedronate with calcium is available in a weekly dose with daily calcium. Ibandronate is available in a monthly dose and as an intravenous injection administered once every three months. Oral bisphosphonates should be taken on an empty stomach and with a full glass of water first thing in the morning. It is important to remain in an upright position and refrain from eating or drinking for at least 30 minutes after taking a bisphosphonate. Side effects for bisphosphonates include gastrointestinal problems such as difficulty swallowing, inflammation of the esophagus, and gastric ulcer. 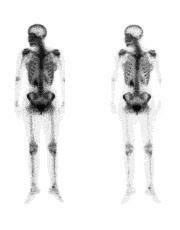 There have been rare reports of osteonecrosis of the jaw and of visual disturbances in people taking bisphosphonates. Brand names included in this publication are provided as examples only, and their inclusion does not mean that these products are endorsed by the National Institutes of Health or any other Government agency. Also, if a particular brand name is not mentioned, it does not indicate a product is not good. Raloxifene (Evista) is approved for the prevention and treatment of postmenopausal osteoporosis. It is from a class of drugs called Selective Estrogen Receptor Modulators (SERMs) that appear to prevent bone loss in the spine, hip, and total body. Raloxifene has beneficial effects on bone mass and bone turnover and can reduce the risk of vertebral fractures. While side effects are not common with raloxifene, those reported include hot flashes and blood clots in the veins, the latter of which is also associated with estrogen therapy. Additional research studies on raloxifene will continue for several more years. Calcitonin is a naturally occurring hormone involved in calcium regulation and bone metabolism. In women who are at least 5 years past menopause, calcitonin slows bone loss, increases spinal bone density, and according to anecdotal reports, relieves the pain associated with bone fractures. Calcitonin reduces the risk of spinal fractures and may reduce hip fracture risk as well. Studies on fracture reduction are ongoing. Calcitonin is currently available as an injection or nasal spray. While it does not affect other organs or systems in the body, injectable calcitonin may cause an allergic reaction and unpleasant side effects including flushing of the face and hands, frequent urination, nausea, and skin rash. The only side effect reported with nasal calcitonin is a runny nose. Teriparatide (Forteo) is an injectable form of human parathyroid hormone. It is approved for postmenopausal women and men with osteoporosis who are at high risk for having a fracture. Teriparatide stimulates new bone formation in both the spine and the hip. It also reduces the risk of vertebral and non vertebral fractures in postmenopausal women. In men, teriparatide reduces the risk of vertebral fractures. However, it is not known whether teriparatide reduces the risk of non vertebral fractures. Side effects include nausea, dizziness, and leg cramps. Teriparatide is approved for use for up to 24 months. Estrogen/hormone therapy (ET/HT) has been shown to reduce bone loss, increase bone density in both the spine and hip, and reduce the risk of hip and spine fractures in postmenopausal women. ET/HT is approved for preventing postmenopausal osteoporosis and is most commonly administered in the form of a pill or skin patch. When estrogen – also known as estrogen therapy or ET – is taken alone, it can increase a woman’s risk of developing cancer of the uterine lining (endometrial cancer). To eliminate this risk, physicians prescribe the hormone progestin – also known as hormone therapy or HT – in combination with estrogen for those women who have not had a hysterectomy. Side effects of ET/HT include vaginal bleeding, breast tenderness, mood disturbances, blood clots in the veins, and gallbladder disease. The Women’s Health Initiative (WHI), a large Government-funded research study, recently demonstrated that the drug Prempro, which is used in hormone therapy, is associated with a modest increase in the risk of breast cancer, stroke, and heart attack. The WHI also demonstrated that estrogen therapy is associated with an increase in the risk of stroke. It is unclear whether estrogen therapy is associated with an increased risk of breast cancer or cardiovascular events. A large study from the National Cancer Institute indicated that long-term use of estrogen therapy may be associated with an increased risk of ovarian cancer. It is unclear whether hormone therapy carries a similar risk. Any estrogen therapy should be prescribed for the shortest period of time possible. When used solely for the prevention of postmenopausal osteoporosis, any ET/HT regimen should only be considered for women at significant risk of osteoporosis, and non estrogen medications should be carefully considered first. A study of disease management in a rural health care population demonstrates a preventive medical system capable of reducing hip fractures and also being able to save money in the process.